... the "Pioneer" was the SVRR's second No.1 – a name and number it first bore in November 1869. It had previously been the SVRR No.3 "C.K. Garrison"; and before that "Elephant". The No.4 was "L.L.Robinson." Frankly, I've never been satisfied that the SVRR really numbered their locomotives in a formal sense. 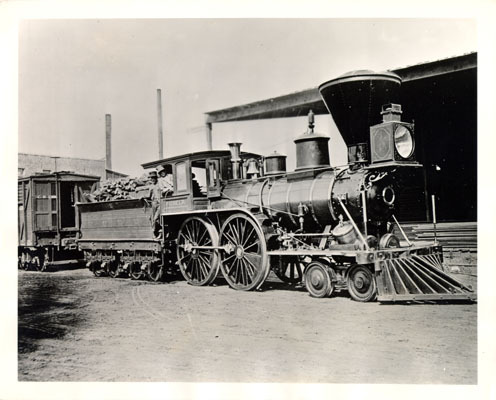 However, "Nevada" – the second locomotive to run on the road – did end up wearing a No.2 late in life, which suggests it had always been No.2, and an 1870 tax inventory identifies the engines by number rather than name. In any event, the 17 November 1855 [Sacramento] Democratic State Journal states: "Engine No.3, to be called the "C.K. Garrison," is now being put together ..." The "Robinson," which seems to have been No.4 all its life didn't show up for another year after "Garrison" was already on the road. Speaking of the well-known photo of the "Pioneer", Dave Joslyn wrote to Guy Dunscomb on 10 October 1957: "The picture that we have of the engine was taken at Front and M streets in Sacramento in 1877, with Engineer Herman Hollsinger in cab window, Fireman Andy E. Brown in gangway of engine." I'm sure the CSRM library has a copy of the classic view of the locomotive after its last rebuilding (1870?). You would need to contact the library directly. ... [A photo of the locomotive Pioneer] is on the San Francisco Public Library site. The description mentions the identification of X-116 on the back of the photos. A quick check of the Southern Pacific X-file listing shows the San Francisco photo came from the Southern Pacific - now held by the Union Pacific in Omaha or Council Bluffs. copies of the photo should also be available from there (if this one wasn't one of the ones pilfered before the collection left San Francisco). ... You can use it to identify the image you want. As I recall, there was also a drawing of the locomotive done about 1857 or so (I think). I believe it was one of the margin drawings included with one of the bird's eye views of Sacramento. In the 1850s and early '60s on the Sac Valley it went by the name of C. K. Garrison - Pioneer was a later name after the railroad came under the control of the Central Pacific owners. ... "Across The Continent." New York: H. Schile, ca. 1868. 17 3/4 x 24 1/4. Lithograph. Original hand color and black painted margins. ... Very rare. A spectacular print glorifying the progress of "civilization" across the American continent. The print was produced by a New York printmaker, H. Schile, a competitor of Currier & Ives who supplied popular prints aimed mostly at the German immigrants so prevalent in New York in the late nineteenth century. Some of his prints were made in Germany, and much of his aesthetic was German in feel, but the subject matter was American, appealing to the immigrant's desire to embrace their new homeland. One of the most noticeable features of his prints was their black painted borders and bright hand color, setting off the primary images against a strong, dark background. Schile obviously copied the idea and basic content for this print from Currier & Ives' print "Across the Continent." That image, representing America's western expansion, was drawn by Fanny Palmer in 1868 ... Schile took the content and concept of that print and modified it in interesting ways. Like the Currier & Ives print, this one shows a settlement consisting of log cabins, with a prominent "Public School," next to a river that flows down from majestic, snow-capped mountains. The citizens of the town have come out to greet a train steaming into town, in this print identified as belonging to the Central Pacific Railroad. The composition was completely changed, however, making it more dramatic in this print and adding some interesting features.